Buy One, Get 2nd ticket at 50% off! 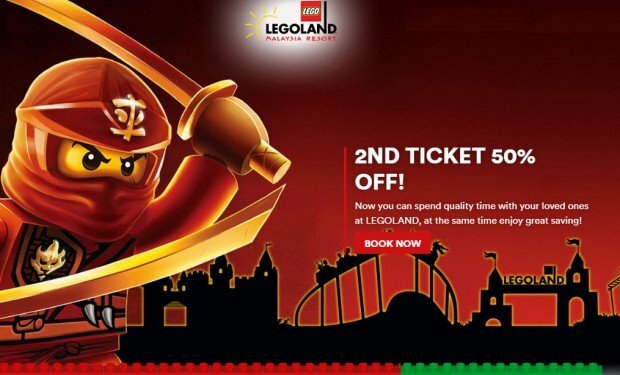 LEGOLAND® Malaysia Resort is delighted to bring you the exclusive offer of the month, when purchasing one full priced ticket you get a second for half of the price. Now you can spend quality time with your loved ones at LEGOLAND, at the same time enjoy great saving! The above packages are designed for group of 2, if you have more members or less wish to come along, you can always book your tickets HERE. Buy one ticket, get a second ticket of equal or lesser value for half price. Both tickets must be in same type. This special rate ticket is only available for online booking when purchase 3+ days early. Only valid for 1-Day Combo ticket, strictly valid on booked date of visit. Checkout Legoland Malaysia for more details about this offer and to reserve your tickets now!